Protean Electric has been moving its EV in-wheel motor from the development stage into mass production. 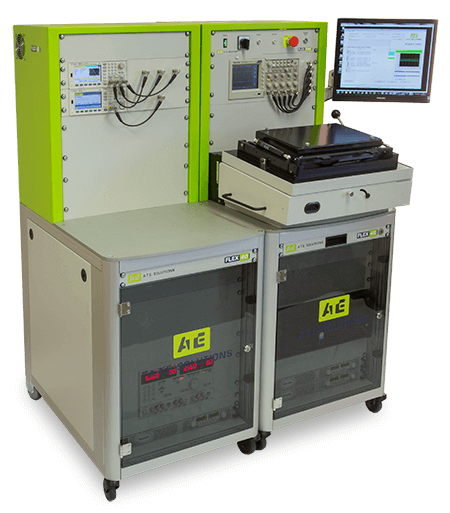 As part of this process it has needed to develop a test strategy that is robust enough for a noisy, high voltage, high current environment. Electric vehicles are slowly but surely becoming established in the mainstream. They are forecast to grow rapidly in the coming years as increased energy density and lower $/kwh batteries increase consumer acceptance and adoption. However, currently only 1.5% of new cars are EVs so much of the current developmental work is aimed at getting EVs and hybrids to the point where they are both desirable and affordable. Suppliers are aware that this is therefore a good time to come to market with innovative solutions for EVs. Protean Electric is such a supplier and already has developed award winning technology for in-wheel motors. It is now in the process of moving from an automotive technology start-up with great technology, to a company that can provide quality product in volume. The product in question is ProteanDRIVE®. ProteanDRIVE is an in-wheel electric drive system that will improve torque, handling and acceleration and could render driveline components obsolete. The in-wheel motors incorporate a combination of over 68 innovations covered by 120 patents and can be used in any vehicle with 18 – 24 inch wheels, including cars, SUVs, vans and HGV’s. It can be designed into a new vehicle, as the only drive system, or used in tandem with a traditional internal combustion engine to create a hybrid. ProteanDRIVE makes it easy to convert an existing vehicle to an electric hybrid model, as the wheel motors can be fitted with minimal disruption to create RWD, FWD or AWD. Existing delivery fleets can be converted to meet ‘clean cities’ requirements without having to change an entire fleet. For some automotive engineers having direct drive – i.e. no gearbox – is a tremendous leap of faith, but Protean has spent ten years fine tuning performance and is confident that the system can increase fuel economy by over 30%. A core design goal was to ensure that ProteanDRIVE could easily be incorporated into any automotive style or platform for easy integration, simplified adoption of hybrid and electrified powertrains and cost savings. But taking a product to volume manufacture is always going to present challenges, and one such challenge for Protean was to build an industry leading test solution for the electronics. ATE Solutions, was selected for both its experience and problem solving ability. Poole commented: “Every little engineering nuance and decision that they made from a design point of view just showed – they’ve been there, they’ve done it, and this is how they now do it because they know what they’re talking about. The level of practical experience was very impressive” ATE also based its solutions on modular hardware, off the shelf components, and industry leading software with Labview/TestStand bought together in their FLEX 40 system – all of which were important to Protean. The requirement for test time was five minutes per UUT maximum. ATE Solutions, whose role it is to develop the system hardware, test software and fixturing for the functional test machine, came up with a solution that took four and a half minutes. Another of the problems faced was that the actual inverter module is very small and test access is severely limited. The high voltage/current test points are only 5mm2. Small test probes are not rated with the sort of power for this application, but a specialist high current probe from Ingun looks like it could offer the solution for the ten high current (momentarily up to 200A) connections per module, while there are around 50 low voltage connections that don’t require such specialist probes. The first system has now been delivered to the contract electronics manufacturer’s site in Austria, where it is up and running. The test function has always been among the most challenging processes in electronics manufacturing. How can test equipment keep ahead of the subassemblies it needs to validate? Evidence exists to show that it can be done.